Pinnacle Liquid Souveran Paste Wax is one of the easiest ways to bring a deep shine back to your paint. This product combines rich carnauba wax with crystalline polymers that provide your paint with a glossy finish and valuable protection. After 18 months in development Pinnacle finally got this product just right and created one of the best forms of spray on protection and shine ever created. The extensive experimentation, refinement and testing combined with the highest quality ingredients helped create this superior spray on product. Spray it directly on your paint and wipe it off with a soft microfiber towel. You will be thoroughly impressed with the clarity of the Souveran and how it makes the paint look extremely deep and wet. This product is so well balanced that you will actually get substantial protection from it as well. Get the ultimate combination of shine and protection in one simple and easy to use product. This is truly a remarkable spray on product that will give you a stunning shine every time you use it. 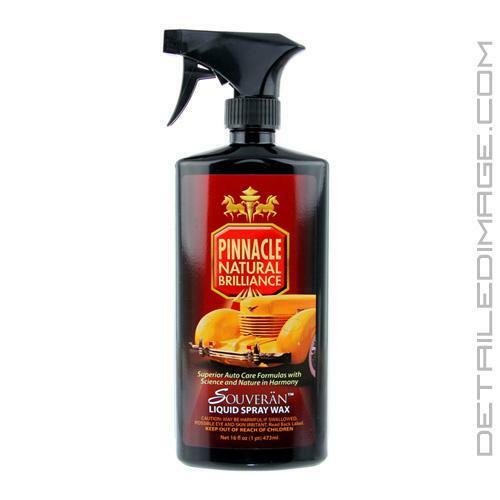 A true Carnauba spray wax with the highest concentration of real carnauba wax available in a liquid. Use to prolong the shine and protection of an existing wax or as an impressive stand-alone wax. Directions: Shake well. Apply to one section at a time on a clean, dry vehicle. Mist the paint and use a folded microfiber towel to spread wax over a section. A light haze may form but it is not necessary to wait for the wax to dry. Flip the towel and buff to a deep gloss. I use this as a maintenance in between waxing with the paste which is incredible. Easy to use nice clean shine and smooth to the touch....Can use it like a quick detail spray.....As always super fast service from the gang at Detailed Image.....My go to for car and M/C care products!!! It gives my car a very good brightness.